Taste test: These potato chips had a pale yellow color with a light smattering of red and green seasoning on the surfaces. We crunched in to find a good crispness and light crunch, with a nice bacon ranch flavor. There was a very even mix of smoky bacon and ranch, fairly strong, and neither of the two tastes dominated. 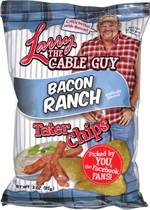 We shared a bag of these chips at a breakfast gathering following an early-morning stairs workout, and the odd thing was that some of the folks who were eating plates of actual bacon and eggs for breakfast refused to try the chips. But most those willing to try did like the taste a lot. Smell test: Nice, can smell both ranch seasoning and bacon.